nhcardhunter has no other items for sale. Details about 1952 Bowman Fred Fitzsimmons – #234 PSA 8! Giants! 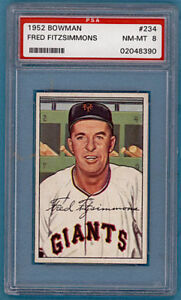 1952 Bowman Fred Fitzsimmons – #234 PSA 8! Giants! $0.50 shipping for each additional eligible item you buy from nhcardhunter.